Platform scales can be very helpful for farmers who may need to weigh animals, crops and other items. Farming is generally outdoor work with exposure to harsh weather and the elements, so the platform scales used must be durable and all-weather capable. The scales should also have good weight resolution since their accuracy can have a significant impact on the farmer’s return on investment. We manufacture and sell industry-leading platform scales for farms at the most competitive prices. Farmers cultivate crops and raise livestock for their own needs and for sale in the agricultural marketplace. From the earliest known written history, farmers have utilized scales for weighing purposes particularly when it was time to trade or sell their products. Today, with the advent of more sophisticated weighing technology, scales are useful for more applications on the modern farm than ever before. Platform scales are perfect for weighing livestock because they generally have low profiles that make it easy to lead the animal on to the weighing platform. Many of these scales also have inclined ends or ramps that help further in this regard. Weighing animals is important in order to know how much food and water they will need. The animal’s weight also allows the farmer to know how much medicine and nutritional supplementation the animal will require. Of course, the animal’s weight is an indication of its general health and well-being. When it comes time to feed livestock, the farmer can use the scale to weigh the feed needed for all the animals. Many scales have built-in computers that will automatically tally the amount of feed required for each head of livestock. In this way, the farmer can distribute feed with precision and save on overhead costs. Platform scales are also useful for weighing crops especially when the crops are already stored in containers. By weighing crops, farmers can calculate when they are ready to transport their product to market. We offer a wide range of platform scales suitable for all types of farm-based applications. These scales have a high resistance to corrosion and are capable of use in all types of weather. Farm work generally takes place outdoors and it involves plenty of dirt, mud, water, snow, animal hair and animal waste. Platform scales found on the farm must utilize durable metals like aluminum and stainless steel. Zinc coatings offer further protection from the elements and from corrosion. The sensors, microprocessors, digital displays and other electronic equipment included on the platform scale must also have water and dirt resistant protection. Imagine weighing animals like horses and cattle in the toughest weather conditions. The scales used must be of the highest quality and durability. Farmers need reliable scales that will not break down constantly in the rough farming environment and make it more difficult for the farmer to realize profits. We feature the latest technology that allows the farmer to work efficiently with minimal maintenance worries. The platform scales are durable with construction that incorporates decades of experience in weighing technology design, engineering and manufacturing. Low profile – The very low 1 7/8 inch profile allows animals to easily step onto the scale. Rugged construction – The platform is available in stainless steel embedded into a welded aluminum frame. The scales have no moving parts and the design is optimal for shock and corrosion resistance. Water resistance – Plastic sealing protects the digital display and sensor equipment from moisture. Large, easy-to-read display – The display features one-inch high graphics for easy reading from a distance and the user can turn the monitor as it has a swivel mount for multi-angle viewing. Excellent weight resolution – The 3200 Series reads in 0.1 pound increments. Three-year warranty – We provide a special three-year labor and parts warranty for their products. The scales provide a warning when the load reaches 102 percent of capacity and they can safely handle up to 150 percent of capacity. Power requirements are 117 VAC and 50/60 Hz while the operating temperature is 14¡F to 104¡F. Optional features for the Series 3200 include Ethernet connectivity, rechargeable battery pack, USB port with Windows interface and USB memory stick data storage. Another great series of products for farm use are the our floor scales with LCD digital display. These scales come in 12 options based on capacity, resolution and platform size. 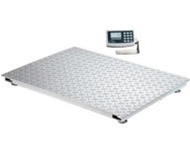 The floor scales are easy to use with low profile and high accuracy. The stainless steel construction is perfect for the rough farm environment and the electronic equipment features protection from moisture and other elements. The large graphics display mounts on a swivel so that the user can adjust the angle of the display for easy viewing. Our platform scales come with a special Weight Average and Hold feature for livestock use. With this technology, the scale averages the animal’s weight in case of movement allowing for accurate measurement. An example of Arlyn Scales advanced agricultural technology is the automated pig sorter designed by the company’s Smart Sort Innovation department. The pig sorter scale records and analyzes pig weights, and provides feeding information automatically to save the farmer time and energy in caring for their animals. The comfortable flooring protects the pigs against injury and lowers stress during the weighing procedure. We have more than three decades of experience in designing and manufacturing high technology scales and other weighing equipment. The company manufactures its products in the United States and it ships directly to the customer. By using its own internal marketing department, We cut out the middle man, offering prices three to five times lower than competitors for products in the same class. The company develops and fabricates all major components of its scales including load cells, microprocessors and computer technology. The platform scales mentioned above are only some of the products suitable for farm use. To find out more about our full product line, please call us to speak with one of our scale experts using our toll free phone number, 800-645-4301, from Monday through Friday during Eastern Time business hours. We are dedicated to providing customers with excellent products and the best customer service. Our reps can quickly find the scales that are right for your needs. If you find what you like on the website, you can also purchase products directly online using our secure, certified shopping cart technology. Call or click today!.